Luxurious Waterfront Cottage Ideal for Romantic Escapes! 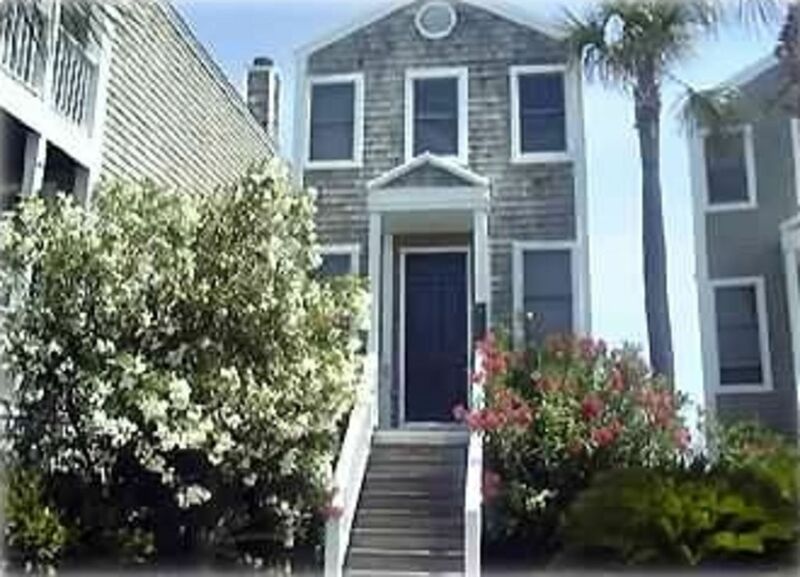 Ocean Cottage is a luxurious 'honeymoon' style retreat that boasts spectacular views of the Atlantic Ocean and Fripp Inlet. You are likely to see dolphin playing in your 'front yard.' With water views from almost every room, you'll also enjoy two decks... one with a Jacuzzi tub just outside the Master Bedroom. With hardwood floors, and a cozy fireplace, we promise you won't be disappointed! Conveniently located across from the Ocean Point Golf Course, and Ocean Point Grille, this cottage also overlooks the swimming pool....just steps away. There are several wide, quiet, sandy beaches just a bicycle ride (or golf cart ride) away (both are available for rent on the Island). There are several restaurants on Fripp.... the Beach Club, elegant seaside dining for gourmet dinners and exceptional Sunday brunches... the Bonito Boathouse, overlooking the Marina and spectacular sunsets ....and The Food Court, for a casual bite. Lovely Beaufort, SC, a short 19 mile drive, offers a myriad of additional choices with regard to fine dining and relaxed waterfront restaurants, and makes a delightful day trip.... with all of the history and charm of Charleston. Fripp Island is located just 65 miles northeast of the Savannah, Georgia airport, and 90 miles southeast of Charleston, SC. Come for a visit. We think you'll like it so much, you'll come back over and over again. Gorgeous views of the Atlantic Ocean and Fripp Inlet right off the deck. Bicycles are available for rent on the island. There are 2 decks....one off the Living Room, and one off the Master Bedroom. Tennis Courts are available on the island. Amenity cards are required to play, and there are court fees. There are 2 golf courses on Fripp.... Ocean Point Golf Club and Ocean Creek Golf Club. Amenity cards are required to book a tee time, and green fees apply. There is a pool right in front of the cottage for your use. With amenity cards, you can use several pools on the island. jacuzzi type tub is set on the upper deck, overlooking the ocean. Please note - there is NO Cleaning Fee. Cleaning is included in your stay. As are 2 amenity cards with a weekly stay, which gives you access to all of the pools, beaches, golf courses, tennis courts, as well as the restaurants.....without these cards, you won't have access to the Fripp Island Club amenities. For shorter stays, cards can be purchased through the owner, prior to arrival. My wife and I decided to visit Fripp Island for a quick get-away and found this unit on VRBO. The unit has a great view overlooking the ocean, and is beautifully appointed and very-well maintained. Mary Beth was extremely helpful with all the details and we had everything we needed for a relaxing, romantic stay. We will definitely book this unit again on our next visit! We had the most peaceful and restful Christmas on Fripp Island. The townhouse was charming. Just the right amount of space for the two of us. Waking up each morning and being able to see the sunrise and dolphins playing in the ocean without even having to get out of bed was the highlight!! The owner was wonderful to deal with. We had everything we needed. We will be gong back for sure!! This is the second time that we have been here. It is beautiful and relaxing. First impression very cute and cozy. It had a lot of amenities in some areas but missing some or none in other areas. The curtains in the living room couldn't be shut because the rod would always come apart and off the hook, the bed was hard as a rock. I have to be honest and say the most uncomfortable bed I have ever slept on. This is why I gave it a 3 star vs. a 4 because 5 nights on a bed that is so uncomfortable I also don't think it was a queen size I think it was a full size. My husband and I sleep on a queen at home and this was much smaller. The location of this place is awesome has a great view and private. I got to see Dophins. The cottage is close to the pool; however, the pool lights come on at night and it is very bright so the bedroom is extremely bright. The curtains don't shut very well as this rod comes apart. They are also not black out curtains more like sheers so you are sleeping in a very well lit room. This place has the potential be be a 5 star easily because it is newer and nice but it just needs some attention to detail and updating. TV's are very old and not that I want to watch TV while on vacation but we had a ton of rain while we were their and in the evenings when you are exhausted nice to sit down and watch HULU or NETFLIX but these tv's are extremely old and don't have that capability. My friends had this capability in the ones they were staying in. I would get another mattress for sure (biggest issue) and they have the room to get a King size bed it would attract more people. AT least get a true COMFORTABLE queen. I get black out curtains or blinds and fix those darn rods. Provide a decent broom and or vacuum so guest can sweep especially with all the sand that is being drug in. Provide dishwashing liquid and washcloths so we can clean dishes ( I did clean mine but had to go buy a sponge) Provide handsoap and possibly leave more than 4 towels for 2 quests staying over 5 nights?? It worked out I washed them several times but just a thought. Pots/Pans...you have a decent amount but a ton of lids that don't go to anything I guess the pots are missing??? provide salt/pepper, Toaster was broke you have to lift it up yourself because the toast will never pop up on it's own. Burnt several before we figured this out. Just needs some attention. Several little things just add up to a lot. The cottage was very well maintained and very comfortable providing everything you need just bring your suitcase! The view from both balconies was spectacular and a very good place to have coffee in the morning and enjoy the sun rise. Will most definitely be returning! Near Charleston and Beaufort, South Carolina. Fripp Island is located just 65 miles northeast of the Savannah, Georgia airport.